Ever been to a rock concert? Then you know that fire alarms are significantly louder than that. In fact, many people find themselves loathing the sound of a fire alarm. But why are these safety features so incredibly loud? Here we break down the issue to help you understand fire alarms and what they are all about. Fire Alarm Volumes Are Different- But Why? So, the basic goal and job of a fire alarm is to make absolutely sure that everyone in a building understands that they must evacuate quickly. In fact, fire alarms are the initial component in a fire safety system that lets people know that a fire might be brewing in the building. As a result, fire alarms need to be loud so that everyone can hear them and get to safety as quickly as possible. The high volume requirement for fire alarms is incredibly critical for safety reasons. Protecting your ears during a fire alarm going off is something that many people want to find. In fact, the first instinct for most is to quickly cover the ears. This is surprisingly a very effective and efficient way to defend against hearing loss while you walk calmly toward an exit in a fire emergency situation. 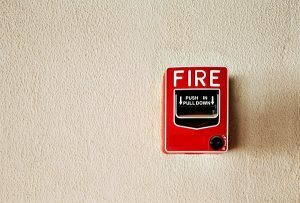 However, it is also important to note that having a fire evacuation plan and holding fire drills is essential to ensure that everyone stays safe during a fire emergency situation. But, if you still think that the decibel level of the fire alarm in your home or building is still too high then you should contact a professional to examine your equipment and settle the debate once and for all. This entry was posted on Thursday, November 15th, 2018 at 4:32 pm. Both comments and pings are currently closed.